The Finish by Billy McDaniel. Paperback novel printed in 6x9" format with large text. Easy to read, beautiful glossy cover, and personally signed by the author. Drew Brennor is a small town New England magician who starts receiving gambling tips from an elusive Las Vegas hustler known as Jack Diamond. 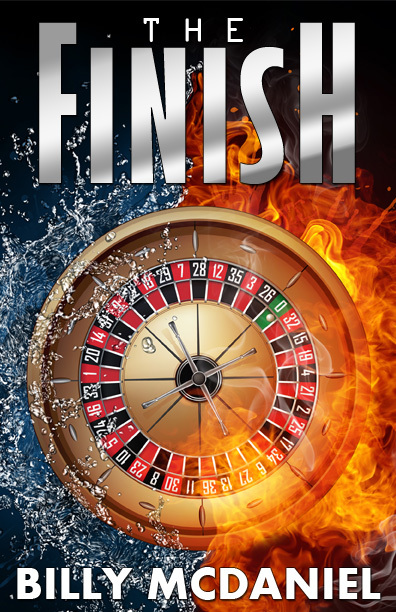 Drawn in by the advice, Drew wins millions, but soon discovers Jack has only been using him to settle a score with the casinos that banned him. The hustler wants to destroy Las Vegas and put an end to the gambling industry for everyone. Drew must work together with his friends, Marcus, Brandi and Nastja in order to stop Jack before destroying Sin City and pushing the blame on his victims. "Only half a glass?" He asked. Holly nodded her head, closing her eyes in disbelief. Her curly locks of blonde hair fell loosely around her shoulders. "I usually drink rum and coke." Holly was well aware of what Jack drank. It was her job to restock his bar, and she often served his drinks. He was holding the glass as if it were a can of beer. She held her glass up. "Hold it like this." She demonstrated. She held the stem of the glass between two middle fingers with her palms facing upwards. "What difference does it make?" Jack began to take a swig. She stopped him. "No. Not like that." She pulled the glass away from his lips. "Haven't you ever had a glass of wine before?" She guided his fingers around the stem of the glass. The bowl of the cup rested serenely upon his palm now. "It's delicate. Like a woman." Jack watched curiously. He was amused by the degree of precision involved with something so trivial. She began to make a circular motion with her wrist. The fluid danced around slightly. Jack tried to imitate her motion. His wrist moved faster, causing the wine to splash around inside of the glass. "You'll bruise it. You've got to be gentle." She corrected. "Now, hold it up to your nose like this." Holly lifted her glass slowly and breathed in the vapors. Jack followed her lead with slightly less elegance. "Just breathe in the aroma. It's sort of like taking a drag off of a cigarette. Hold it in for a moment, and then release." Jack smiled. Never in his life had anyone put so much emphasis on methods of drinking. The fruity aroma filled his senses. It made him want to gag. "Good." She smiled. "Now take a sip and just hold it on your tongue for a moment. Let the flavor find your senses." She took in a very small sip and held it inside her mouth. Jack drank from his glass. He wasn't accustomed to the flavor and wanted to spit it out. Holly stared him down, prepared to deal with his intolerance. She swallowed hers down signaling Jack to follow. "What was it like?" She asked. "Fruity. Not really my style." Holly danced with Jack on the deck for a few moments. There was no music, but the mood seemed fitting. There weren't many boats this close to the dam. The sun cast a dark shadow over the canyon walls. Jack held her in his arms for a while longer. "Do you still taste it?" "Yeah. I wish I had some rum to get rid of it." Jack laughed. "That leftover taste. It's called the finish." She explained. "They say, the longer the finish, the better the wine." She circled the fluid around once more, brought the glass up to her nose and began to repeat the process. "Indeed." Jack paid a lot of money for that bottle. He was glad to know that it was well spent.